Darren Rea: Product Enterprises merchandise is high quality, but caters for a niche market. Why do you think there is such a fascination for things past? Stephen Walker: That's not a straight forward question. I'm coming from a position where my interest in science fiction, and the whole reason I am doing this, allows me to make the toys that I want to buy. 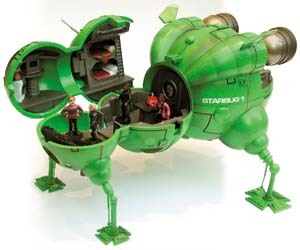 But why science fiction toys capture the imagination of collectors is down to a number of things. You could argue that a lot of your sci-fi fans are sad old geeks with no girlfriends and no lives. So it could be that they are harking back to their childhood and wanting to be snuggled up in the womb. 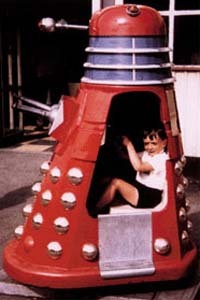 And surrounding themselves with Daleks makes them feel safe and comfortable and hidden away from the World. Or, more seriously, you could argue that there are more interesting products to be derived from science fiction programmes than other show - an electronic spaceship is going to be much more interesting than a talking Eastenders Dot Cotton doll I would have though. Although, having said that, my mind is now ticking over thinking 'now there's a range'. I think science fiction attracts a type of person that tends to have more of a creative steak in them, possibly more of a disposable income... it's just one of those things that is hard to put your finger on. DR: When I was a young lad, I'm in my early 30s now, the three toys that everyone wanted were the miniature Star Trek Enterprise, The Batmobile and the Eagle from Space 1999. I notice that the Gerry Anderson shows are something which are coming back into fashion again and that you are currently marketing a Gerry Anderson range. Are the dynamics of the market shifting? Are adults buying more toys for themselves? SW: In recent years there has been a huge shift towards nostalgia and there has been a huge push for Bagpuss and Clangers merchandise. Children's programming at present, or more accurately programmes created today for children, is appalling. You only have to watch Saturday morning children's programmes to see that there is nothing there to inspire kids. I think a lot of adults are buying videos and DVDs of programs they grew up watching and the kids are seeing them and enjoying them. Our Doctor Who range was aimed originally at the hard-core Who fan base. But now about 40% of our customer base for this range are children under 15 years of age who have probably never seen an episode of Doctor Who but who like the look of the Daleks and the Cybermen. What you have to bear in mind is that the only reason we can produce these kind of products is because we are not a big company and we don't have the overheads. 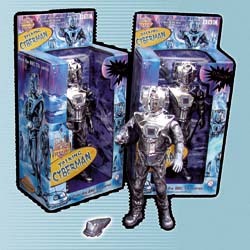 Large toy companies couldn't touch things like the Doctor Who licence, or do the Gerry Anderson die-cast range. The market is big enough to make it worth our while, but it certainly isn't big enough to make it worth the while for larger companies. Having said that, my background is 10 years in a design company for Mattel and Disney in LA. Both companies were aware of the growing cult market and we did develop and design quite a lot of ranges, a lot of which never made it to production, that were aimed more at the adult collector than children. Product Enterprise is more involved with the cult market and the licenses we currently pursue are the kind that are not really of interest to the bigger companies. The products are also my own personal favourites. I make toys that I would buy as a collector. Another reason that the larger companies can't really tackle this market is because the kind of people who work on these ranges are unlikely to be devoted fans - the love and passion for the subject matter doesn't translate into the product. We are trying to make products that if we saw on a toy shelf we would rush out and buy. DR: I notice you are launching a new range of Carry On figures. How do you go about deciding what products the market will buy into? SW: A lot of it isn't research, more gut instinct. I know I'm a huge Carry On fan as are my immediate circle of friends and surely we can't be the only fans out there. Then we weigh that up against what the production costs would be and what the minimum run we'd have to do and just take a guess as to whether we could sell enough if we generated enough awareness of the product. Once we start to run out of licences that we are that familiar with we would have to do much more market research. But at the moment we go by our own personal interest and hope that we are not the only sad person in the World whose going to bother buying them [laughs]. DR: Is packaging something that you give a lot of thought to? SW: When designing the packaging we try and keep everything in style with the programmes. For example, with The Avengers dolls we used a very simple, classic black and white box which is designed to transport the buyer back in time to the era the series was first broadcast. DR: Action figures today seem to be a lot more detailed to those 20 years ago. What part has new technology played in creating more accurate character likeness'? SW: There has been a huge increase in leaps forward in technologies that are available but I think a lot of this ability has always been there. It's just that manufacturers in the past have never felt they have to go that extra mile - because they are just toys. 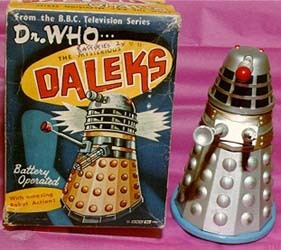 I remember when I was a kid growing up with the Louis Marx Bump and Go Daleks [pictured left]. 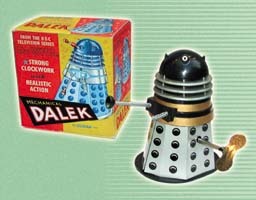 As much as I loved them I could never understand why they never quite looked like Daleks. As I became involved with toy manufacturing and started to understand the manufacturing process I started to realise that it is all to do with cost. The fact that the Louis Marx Daleks didn't look like the TV versions was not because he couldn't make them look that, it was just more economical to modify the shape so that it was easier to tool in less pieces to make it cheaper to produce. There are limitations with manufacturing even now. And we are constantly battling to make a compromise between accuracy and what is economically viable. 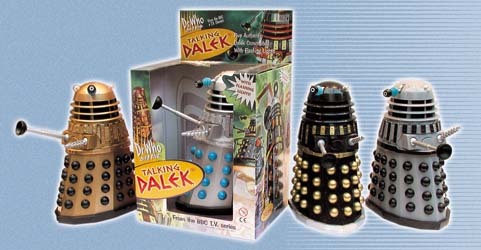 We do get people who don't understand manufacturing who will ring up and ask: "Why is the such-and-such on the Dalek one micron out?" We have noticed that and while we want to make them as accurate as we can, even we are tied to certain constraints. We get it right about 95% of the time and we could get them 100% accurate but they would be way too expense to produce. DR: Most of the toys you produce are based around UK shows. How does this affect overseas sales? SW: With shows, like The Avengers, we have been surprised at how huge the show is in Spain, France and Germany. 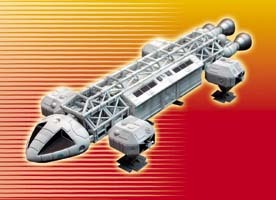 Japan is the biggest collectors when it comes to Gerry Anderson shows - they go nuts for all things Gerry Anderson. The US are huge Doctor Who fans and Australians love Red Dwarf. So, while the stuff we deal with is UK based it does translate well in other countries. DR: Because the market you deal with is a retro market do you think there will be a market for you in 10 years time? SW: Personally, I think that our generation, I'm 30-something, will grow old with us and so that market will always be there for my generation. I don't care beyond that point because I'll be dead [laughs]. I think the market will start to dwindle and in the next few years the market will be so saturate with products for every retro programme you can think of that there will be nothing left to reissue. 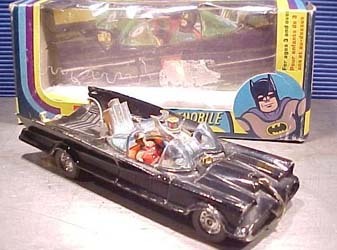 Corgi have just dug out all the old tools and have started reissuing all of their classic toys apart from the Batmobile. I'm surprised they haven't found that tool yet. The market will always be there, but there will be nothing left to do after say the next five years. DR: How far can you go with niche markets? Would you ever consider releasing things like a Sylvester McCoy doll? SW: We get asked all the time by fans for things like a talking Jo Grant doll or a fully articulated Elizabeth Sladen. And while I'd love to be able to do these I know that we would never sell enough to make it worth our while. So we have to go for the most popular Doctor - Tom Baker. We'd never sell enough McCoy dolls. We'd love to do other villains from Doctor Who, but we know we wouldn't sell enough. DR: Thank you for your time.